Wolfs Shipyard Forum • View topic - NERF &amp; STAR WARS UNITED! 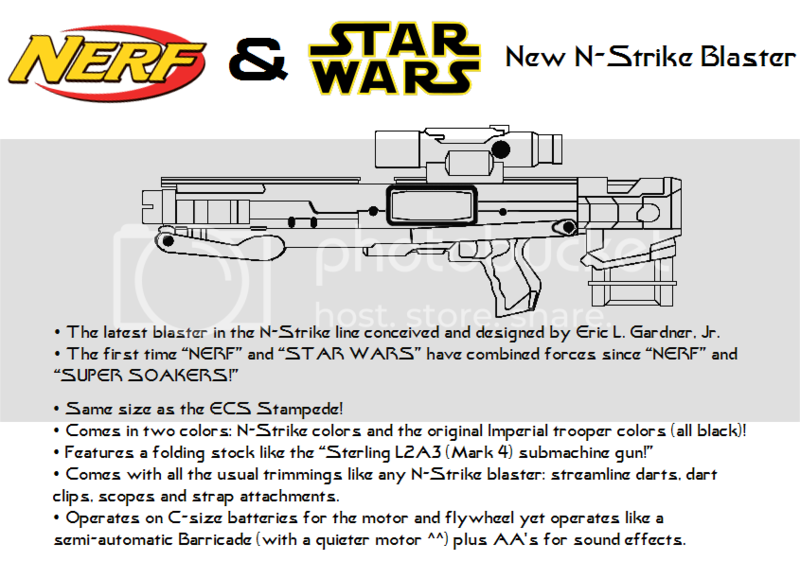 NERF &amp; STAR WARS UNITED! Post subject: NERF & STAR WARS UNITED! I've made this blaster through the use of Photoshop out of parts of NERF N-Strike blasters, then drew lines over the edges to create a blank lineart. Credit goes to me for making this brainchild of mine. So..tell me what you think of it. Thanks a lot. I've had some time before finalizing my N-Strike design. Hopefully I'll submit this to Hasbro and...see where it goes from there. If Hasbro makes it then my son and I will be buying them. Woohoo more Nerf wars in the basement. Reminds me of the T-800 rifles from Terminator. all the same, nice work! Thanks. So far I got both sides of my blaster made....but the front and top views are going to be....tricky at best. I have here the promotional ad for my blaster that was done a year ago.